In an environment of uncertainty surrounding the future of Medicaid policy and funding, addressing the social determinants of health to improve the health status of Medicaid beneficiaries could be dismissed as an unaffordable luxury. But there is a strong business case for state Medicaid programs to address the social determinants of health as a key strategy for providing cost-effective, efficient care. By partnering with state and local agencies to address the social determinants of health, state Medicaid leaders may enhance their ability to control costs and strengthen the program’s financial sustainability over the long term. This policy brief explains how state Medicaid agencies and managed care organizations can address the social determinants of health (SDH). 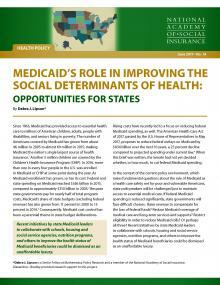 It reviews the evidence demonstrating a link between health status and SDH, summarizes the business case for Medicaid to support interventions aimed at addressing SDH, describes current opportunities—and limitations—for using Medicaid as a lever to address SDH, and discusses new prospects for state policymakers to tackle SDH in the current environment. This brief was supported by the Robert Wood Johnson Foundation in conjunction with the project Strengthening Medicaid as a Critical Lever in Building a Culture of Health.